Have you heard of Daria Music? I stumbled upon her website while searching for music learning resources and fell in love with her website and music. She has a fabulous voice and all her songs are amazing and very inspirational. My favorite thing about Daria's music is that she introduces children to music from around the World. She incorporates different languages, musical instruments, people, places, etc into all her songs so children experience more than just simply listening to a song. She also encourages parents and teachers to create your own instruments so you can play and sing along too. You can read more about Daria and her travels around the World on her bio page. Oh and she even has a page for homeschoolers with some great information!!! Daria was kind enough to send our family the "I Have A Dream" CD to review (be sure to click the link to listen to sample songs). The day it arrived my kids were eager to listen to it. Now I don't know about you but sometimes children's music drives me crazy. Much of the music today forchildren is not very original, annoying, teaches nothing of importance...know what I mean? Well Dari's music is none of the above. Actually I don't even mind listening to the CD by myself (which I did while I wrote this review). The CD is about 26 minutes long and features 10 great songs. Many of the songs on the CD are very spiritual and have great meaning to them. The CD jacket features a really cool illustration actually done by an 8 yr old girl. Inside the jacket are all the words to the songs along with brief information about the songs origin and the instruments that were used. The songs on "I Have A Dream" will teach children important values such as being kind to others, love, respect for people and animals, service, peace, equality and more. Obviously, hence the name, there is a song about Martin Luther King which is the main reason I chose this CD to review. It is a great song to listen to this month as we are approach Martin Luther King Day. Martin Luther Kind Day is such an important day to teach our children about. So much can be learned from this amazing man and what better way than through a spiritual, uplifting song. There are also songs on the CD in Spanish. Hebrew and Zulu. There is also an amazing song called "Ride, Horse, Ride" which is my favorite as well as Gwyn's. 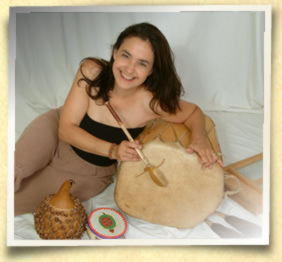 This song uses traditional Native American Instruments like a Pueblo drum, Native flute, shell rattles and Iroquois bone rattles. The song even has a Clan Mother (Red Singing Bird) doing some of the vocals and instrument playing. Gwyn is fascinated with the Native American culture and horses so this song really captured Gwyn's heart. She immediately knew it was a Native American song and what instruments they were playing. The song teaches children about respecting animals as well as learning and being encouraged from them. I also really enjoyed the African/American spirituals. And it turns out this CD will go along great with our unit study this month too, on Marine Mammals. There is a song called "Wild and Free" which is about dolphins, whales and manatees. This song is about protecting our wildlife and is sung to the tune of "My Bonnie Lies Over The Ocean". This is definitely a CD that you will listen to over and over again with your children. Each month Daria has a monthly song page which has lots of freebies including songs, links to printables, videos, instrument making how-to's and more. There is also always at least one great giveaway (many times more). The dolphin song and horse ride songs were my favorite. I like all the different instruments in the songs. We listen to the CD a lot in the car. I hope mommy gets more of the CDs for us to listen too and some more instruments too. The songs and CDs can be purchased on Amazon in both MP3 and hard copy. Or you can also order them directly from Daria's website. Most of her songs are also available on iTunes as well. Prices vary on products. 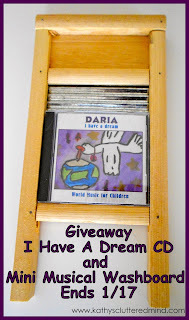 Daria has graciously offered to give away the I Have A Dream CD as well as a mini-musical washboard. Only the first entry is mandatory. Other entries are optional and give you extra chances. This giveaway is not affiliated with Facebook in any way. The winners will be posted on the blog and will be emailed. Winners must reply within 48 hrs with their contact information or another winner will be chosen. Prize will be mailed by Daria. *Disclaimer - I received a copy of I Have A Dream CD in return for my honest review. Please note that prices indicated in the post are subject to change. I was not compensated for my review and all opinions are our own! Many of the links found on my side bars and in my blog posts are affiliate links. As a result, I might get paid money and I will most likely spend the money on homeschool supplies. Both of our daughters love piano. My daughter loves to make maracas out of anything that she can shake! But she will also make a drum out of crayons and coloring books too! I have a daughter that loves piano and another that enjoys drumming.